Decals by Design provides end-to-end production services beginning with the processing and formatting of your design. You can provide us with photographs, illustrations, finished art on a disk or any combination of artwork to formulate your design solution. From low tech to high tech, our experts have you covered. We utilize the highest quality materials including pressure sensitive vinyl and inks from 3M. 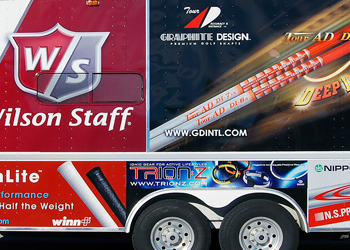 Graphics can be created for any type of vehicle. We also offer conspicuity striping for vehicles, which helps reduce accidents, insurance claims, liability exposure and down-time. Our materials can be designed to last up to seven years, which is twice the average lifespan for most paint and other traditional applications.